Allison Rosenberg is a student in the field of food science, studying at Tel Hai College. 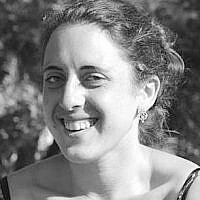 She made Aliya in 2005 from Chicago, IL and is currently living in Kiryat Shmona. Along with a very diverse group of 10 students including herself, she is working on a project aimed at finding a cure for CF, fixing the F508 mutation (the most prominent in Cystic Fibrosis) with the use of the CRISPR technology. This is the most common lethal genetic disease worldwide, and affects multiple organs, the most prominant being the lungs. Patients suffer from difficulties breathing in addition to malnutrition and as of now the average survival age is approximately 37 years. In addition to the lab work and research, her team is taking part in multiple projects aimed at raising awareness about the disease, and the 680 patients in Israel who suffer from it. Allison sees this as an incredible privilege and wonderful opportunity to represent her country and to truly better society with the help of science. Allison and her team will be competing in an international competition in the field of synthetic biology (Igem) in Cambridge, MA, and plan on continuing after that as well with our medical research in the Northern Galilee, and therefore, would appreciate any help and support available. Remember, every breathe that you take, is truly a gift!